The key to this paragraph will be printed next week. The ceilings in both halls of the annex were newly painted last week. There are many absent from school on account of colds and the grippe. As some recover, others get it. On Friday night of last week our basket ball team suffered a defeat at the hands of the Sylvania team. The score was 13 to 8. Helen Ballard, Kathryn Wolcott, and Mary McGee, are recent additions to Carpenter and Pierce Co.’s Croupe Ointment packing room. The mid-year examinations will be held Tuesday, Wednesday and Thursday, of this week. Rev. O.R. Palmer conducted chapel on Tuesday of last week. Miss Jane Parsons visited school last Wednesday. The Band had a very successful rehearsal Monday night. Director H.C. Sherman is drilling this talented organization on some new overtures. Professor R.W. Helm, Supervisor of Agricultural Education is eastern Pennsylvania, spent a few hours inspecting the agricultural department of the high school Friday morning. Mr. Helm stated that several pictures of this department are the best that have been received at Harrisburg. Lantern sides were made from them and were shown in three towns in Pennsylvania one night. These pictures will be in a bulletin that is to be issued soon by the Vocational Division of the Department of Public Instruction. A farmers night school will be held in the school building, beginning January 31, at 8:00 P.M., and each Monday following until February 21. February 24 and 25, the Second Annual Institute will be held in the Court House by the Troy High School Department of Agriculture in co-operation with the Bradford county Farm Bureau. Here is an opportunity to secure practical agricultural information free of charge. Everybody welcome, Monday January 31, at 8:00 P.M. Do your part by being punctual. Ralston High School Basket Ball team will play the Troy team Saturday, at 8 o’clock in Sweet’s Court. Come out and root for the boys. Per cent of attendance 96. Neither absent nor late..Theodore Baxter, Ruth Anderson, Francis Saltmarsh, Ellery Califf, Lee Cleveland, Robert Ellenberger, Harvey English, James Judson, Charles Johnson, Maurice McGee, Robinson Pierce, Frederick Pomeroy, Charles Say, Lee Smith, Allyn Smith, Max Vineski, Robert Van Syckle, Albert Watkins, Glen Weigand, Theodore Watkins, Fred Watkins, Leonard Wilcox, Milton Gallard, Gladys Ayers, Celia Bullard, Florence Burnham, Margaret Burnham, Helen Ballard, Pauline Besley, Julia Burton, Jeanette Case, Margaret CorNell O’Connor, Cora Pierce, Flossie Elizabeth Morse, Mary McGee, Janice Mitchell, Mae Nelson, Violey Newell, Nell O’Connor, Cora Pierce, Flossie Purvis, Ella Rockwell, Margaret Swain, Helen Seribury, Iva Tomlinson, Anna Bell Williams, Katherine Wolcott, Dorothy York, Leah Clayson. Neither absent nor late: Mildred Baxter, Ether Bovier, Grace DeWitt, Geraldine Howland, Elizabeth Joralemon, Hazel McKee, Olive Pierce, Addie Smith, Gladys Thomas, Virginia Thomas, Eleanor Walters, Mildred Wolcott, Robert Grant, Henry Johnson, Thomas McGee, Edward Smith. Neither absent nor late: Madora Flick, Ruth Isaacs, Helen Letts, Mary O’Connor, Lura Robinson, Lena Robinson, Majorie Stuart, Genevine Wilcox, Llewellyn Hickok, Philip Lyles, William Montgomery, Francis McGee, Merle Watkins, Austin Young. Neither absent nor late: Arline Campbell, Janet Carnochan, Ethel Carnochan, Rebekah Fanning, Josephine Flick, James Gibson, Herbert Green, William Hickok, Katherine Hocley, Albert Holloway, Charles Newell, Harvey Smith, Wilda Smith, Louise White, Clifford Newell. Neither absent nor late: Eleanor Ballard, Leon Baxter, Lawrence Gustin, Elree Hunter, Willaim McGee, Floyd Smith, Ned Stanton, Paul Wood, Harry Hurlburt, Fannie Hil, Anne Jenette Morse, Helen Potter, Markette Williams, Ethel Smith. Neither absent nor late: Russel Comfort, William McCelland, Sevelon Smith, George Watkins, Clara Aidrich, Francis Brigth, Irene Brown, Hope Crouch, Barbara Morse, Kathryn Potter, Isadore Robinson, LaVella Ross. Neither absent nor late: Willis Ballard, Franklin Poter, Robert Reynolds, Leah Campbell, Helen Colby, Carolyn Fanning, Dorothy Freelove, Lucile Hungerford, Laura Putnam, Zelma Smith, Thressa Thompson, Laura Guthrie, Harold Bailey, Kenneth Bond, Howard Peters, Lester Putnam, Harold Rumsey, Wesley Guthrie, Margaret Baxter, Marjorie Bohlayer, Sophia Pomeroy, Ruby Watkins, Verna Chamberlin. In spite of the inclement weather there was a good attendance Monday evening when the Farmer’s Night School opened. Mr. Guillaume gave a practical lecture on orcharding. His enthusiasm made all his hearers desire to start an orchard. The next session of the night school will be Monday evening, Feb. 7, at which time Mr. D. K. Sloan will lecture on Fertilizers. A Glee Club consisting of sixteen voices has been organized under the leadership of Miss Wheeler. This will be a valuable addition to the organizations of the high school and will furnish music on special occasions. There will be no school on Friday of this week at which time the teachers will make thier annual visit to other schools, some will go to Willamsport, others to Elmira, and others to Waverly and Sayre. The Junior English class has begun the study of the Roger de Coverly papers. Nearly all the students who have been out with grip are back at work. The sophomore boys seem to like the front seats in the assembly hall. Special examinations will be given to those who were sick last week. Miss Rhea Barker visited the school Monday afternoon. Miss Kathryn Wolcott is now boarding at F. W. Hovey’s. High school is improving in basketball. Three games were won last week. Thursday night the high school team defeated the town team 29 – 19. Friday the freshman team defeated Sylvania second team 17 – 10 and Saturday night Ralston high met defeat 16-10. After this game the students had a big celebration. Following is the line up. Troy H. S. Position Ralston H.S. Goals from field. Smith 3, Flick 2, Williams 2, Stickler 2, Henry 3, Golas from fouls, Smith 2. They were packed in like sardines there were no uniforms just a crowd of men men in blouses men in patched jackets well dressed men no distinction of class and on the platform the women and children they were leaving there was no laughter none of the gayety with which one has so often reproached this race but neither were there any tears. The following students from Bradford county are enrolled in the Mansfield Normal School. Andrus, Ruby – Burlington, Pa.
Ayers, Dorothy - Snedeckerville, Pa.
Bailor, Florence – Athens, Pa.
Barrett, Anna M. – Snedeckerville, Pa.
Baxter, Myron – Granville Summit, Pa.
Beibach, Mildred – Sayre, Pa.
Biles, Anna M. – Camptown, Pa.
Bostwick, Lillian – Athens, Pa.
Boyd, Eleanor – Wyalusing, Pa.
Bullock, Ruth – Columbia X Roads, Pa.
Button, Leslie – Troy, Pa.
Campbell, Ruth – East Smithfield, Pa.
Caswell, Marion – Rummerfield, Pa.
Chaffee, Leslie – Potterville, Pa.
Crippen, M. Ford – Troy, Pa.
Decker, Olin – New Albany, Pa.
Decker, Ralph – New Albany, Pa.
Farr, Daniel – East Smithfield, Pa.
Fice, Marian – Athens, Pa.
Garey, Hazel – Wyalusing, Pa.
Garrison, Foster – Columbia X Roads, Pa.
Garrison, Louise – Columbia X Roads, Pa.
Grace, Dora – Towanda, Pa.
Grace, Randolph – Towanda, Pa.
Granger, Gordon – N. Towanda, Pa.
Gregory, Manley – Canton, Pa.
Hannon, John V. – Cadis, Pa.
Hibbard, Hattie – New Albany, Pa.
Homet, Beatrice – Wyalusing, Pa.
Horton, Belle – New Albany, Pa.
Hunsinger, Frank – Columbia X Roads, Pa.
Johnson, Harold – Towanda, Pa.
Jones, Helen – Troy, Pa.
Kunzman, Hazel – Athens, Pa.
Leahy, Irene – New Albany, Pa.
Leahy, Nell – New Albany, Pa.
Leahy, Teresa – New Albany, Pa.
Loomis, Evangeline – Athens, Pa.
Lowe, Lucy – Athens, Pa.
Manley, Elaine – Canton, Pa.
Martin, Beatrice – Sayre, Pa.
Moody, Claire, J. – Canton, Pa.
Neily, Rachael – Towanda, Pa.
Noble, Mildred – Gillett, Pa.
Palmer, Lewis – Sylvania, Pa.
Percy, Inez – East Smithfield, Pa.
Preston, Francis – Canton, Pa. Prince, Elma – Cadis, Pa.
Roberts, Mildred – Gillett, Pa.
Ross, Arthur – Granville Center, Pa.
Ross, Dora – Towanda, Pa.
Scouten, Clifford – Sylvania, Pa.
Segur, Emal J. – Canton, Pa.
Steafarher, Grace – Camptown, Pa.
VonWolffradt, Frances – Milan, Pa.
Walborn, Ethel L. – Monroeton, Pa.
Ward, Bessie – Troy, Pa.
Watkins, Alice – Sylvania, Pa.
Wells, Gladys – LeRaysville, Pa.
Wilcox, Reid – New Albany, Pa.
York, Daisy – Columbia X Roads, Pa.
Prof. L. R. Guilaume was called home Friday morning by the serious illness of his father. The senior class has organized recently by electing the following officers: President, Lee Smith; Vice-President, Elizabeth Morse; Secretary, Violet Newell. The class is planning on giving a play during the nomth of March. The proceeds will be used in making a trip to Washington. The class changed only one rule in their by-laws and that is that the secretary should prepare all the lessons for the class. Ellery Califf conducted the freshmen work in agriculture during the absence of Prof. Guilaume. Miss Strait and Miss Lyon spent Sunday evening in Canton. The Seniors and Juniors are working on their rhetoricals which are to be delivered during chapel exercises. The first one will be delivered Thursday morning. The boys in shop work are doing some practical work by building a cupboard in the drawing room. Mr. D. F. Pomeroy is spending some time this week visiting the schools. The last period Friday afternoon was thrown open to the students for a celebration of Lincoln’s Birthday. The program consisted of songs by the school, music from the Victrola, a quartette composed of Misses York, Fay and Flick and a reading by Archie Rockwell. Miss Jennie Pierce spent last Friday and Saturday at Smithfield. The primary and intermediate grades enjoyed valentine boxes Monday afternoon. The valentines were as part of the work in drawing. Girls – Ruth Anderson, Florence Burnham, Margaret Burnham, Pauline Bosley, Carrie Boughton, Julia Burton, Jeanette Case, Margaret Cornell, Emma Field, Elizabeth Morse, Mary McGee, Janice Mitchell, Violet Newell, Jennie Pierce, Eleanor Reed, Reances Saltmarsh, Dorothy York, Leah Clavson. Boys – Theodore Baxter, Lee Cleveland, Robert Ellenberger, Harvey English, Frank Flick, Maurice McGee, James Peckham, Lee Smith, Allyn Smith, Robert VanSyckel. Girls – Madeline Bardwell, Ethel Bovier, Leola Corey, Elizabeth Joralemon, Margaret Joralemon, Hazel McKee, Olive Pierce, Gladys Thomas, Virginia Thomas, Eva Stephens. Boys – Francis Collins, Willard English, Robert Grant, Thomas McGee, Edward Smith. Girls – Mardora Flick, Ruth Isaacs, Helen Letts, Lura Robinson, Lena Robinson, Marjorie Stuart, Genevieve Wilcox. Boys – DeLace Hoose, Phillip Lyles, William Mongomery, Francis McGee, Merle Watkins, Loyd Worden, Austin Young. Theodore Baxter and Leonard Wilcox attended the Elmira Automobile Show Saturday, Feb. 19. Archie Rockwell was also in Elmira at this time but not desiring to buy a car, he used his time to better advantage. William Hooley, suffering a pain in the stomach, rheumatism and a cold in the head, rendered some excellent discords on the Victrola last Thursday. The High School Freshman Basketball team defeated Alexander’s All Stars from Sylavania by a score of 14 – 13. The Sylvania team made two excellent shots, breaking an electric light bulb each time. They thought by making the room darker to defeat our boys. Neverless our boys showed them that they were not afraid of the dark. Theresa Reidy, Frances Smith, and Leah Clayson attended the dance at Springfield last Thursday evening. Mr. Earl Rolison was severly injured while coasting on Redington Avenue. Llewellyn Hickok spent the week end in Elmira. Miss Hannah Luckey entertained the faculty at her home on Elmira Street on Washington’s birthday. Mr. Grant Fivi visited the school to renew old acquaintances Monday afternoon. He expects to enter State next fall. Theodore Baxter was sick Saturday and Sunday but was able to take up his studied Monday. Dan Holloway, Walter DeWitt and Earl Rexford have joined the alto section of the Troy Engine & Machine Company band. Elizabeth Morse spent the week end with Rhea Barker at Elmira College. Clifton Doane and Francis Ballard have suffered the severe disease of extention of the pant legs. The Boy’s Orchestra gave a dance two weeks ago Friday in absence of the dancing teacher, Miss Case. About two hundred mounts are being prepared for the school exhibit at Towanda. Resolved, That the State of Pennsylvania should issue $50,000,000 in bonds for Good Roads, is the question debated by four high school students before the Troy Good Roads Association last Tuesday evening. The affirmative speakers were Maurice McGee and Frederick Pomeroy; the negative were Theodore Baxter and Henry Case. The judges decided in favor of the affirmative. Mr. D. F. Pomeroy gave an interesting talk in chapel recently. Robinson Pierce attended an athletic meet in Elmira Monday evening. A club of sixth and seventh grade girls have been selling candy on Saturdays for the benefit of the gymnasium fund. They have so far earned about seven dollars. Every little helps and we want a gymnasium next summer. The following high school students who have been out with the measles returned Monday: Lewette Prutsman, Lynn Dunbar, Margaret and Florence Burnham, Emma Field, Milton Bullard, Luther Saxton, John Canedy, Lawrence Greeno, Lucile and Mildred Smith. On March 22, Miss Mabel Mullins will read “Pollyanna” for the benefit of the school. Miss Mullins is an impersonator under the management of the Star Lyceum Bureau of New York City. The Bureau had an open date in this vicinity for Miss Mullins and the high school decided to take it for the benefit of the Athletic Association. The story of Pollyanna is so well known that its presentation is dramatic form should make a pleasant evening’s entertainment. Miss Wheeler and Miss Borden gave the seventh grade a selighride to Sylvania. Miss Flood was called away over Thursday and Friday by the death of her uncle.Violet Newell substituted in some of the classes for her. We are afraid Henry Case will find that feed for speedwell runabout rather expensive. Lee Smith, Robinson Pierce and Frederick Pomeroy motored to Burlington and carried their skates up the hill in hopes that they might get a chance to skate, but the snow was too deep in most places. They all reported the lake frozen to a depth of fourteen inches, but Robinson is the only one who claimed that the ice was hard, and that there were some wonderfully bright shooting stars. Ellery Califf and Helen Ballard were chosen to represent Troy in the speaking contest on Friday at Towanda. The preliminary contest last Friday was excellent. The judges, Mrs. Henry B. VanDyne, T. W. Parsons and O. W. Jaquish, had a hard time determining who were the best. Some of the high school students enjoyed Fritz Kriesler’s entertainment in Elmira, Monday evening. Pauline Nash, a former high school student visited the school Monday. Three of the enthusiastic high school boys who attended the fox chase on Thursday were awarded front seats upon their return. Henry Case enjoyed a ride to Towanda Wednesday on business concerning our school exhibit there. Two students walked to East Troy Saturday afternoon. It took them only half an hour to come back. A merry load of students went to Canton Saturday evening and after seeing the town, returned home at a rather early hour. Frances Burgan spent the week end with her friend, Miss Pauline Card. Mildred Sweet, John Canedy, and Loomis VanHorn, members of the sophomore class, have recently returned to school. The doctors report measles as the cause of their absence. Dorothy York and Grace Whipple have not yet returned. The sophomore class had planned on going to Canton for a sleigh ride Monday night but were disappointed. Measles are going out of style and mumps are coming in again. The senior class enjoyed a sleigh ride last Wednesday evening. Boys – Henry Case, Ellery Califf, Lee Cleveland, Walter DeWitt, Robert Ellenberger, Harvey English, Maurice McGee, Lester Newell, James Peckham, Robinson Pierce, Frederick Pomeroy, Archie Rockwell, Lee Smith, Allyn Smith, Arthur Tomlinson, Albert Watkins, Glen Weigand, Theodore Watkins, Fred Watkins. Girls – Ruth Anderson, Gladys Ayers, Frances Burgan, Julia Burton, Janette Case, Margaret Cornell, Lucelia Fay, Florence Hanscom, Elizabeth Morse, Mary McGee, Janice Mitchell, Eve Morris, Violet Newell, Nell O’Connor, Cora Pierce, Flossie Purvis, Marion Sweet, Eloise Shelman, Anna Williams, Leah Clayson. Mr. John Parke of Elmira; Miss Maude Dewey of Gillett, Miss Vera Vickery of Columbia X Roads, and Arthur Hickok visited the school last week. Eleanor Walters and Olive Pierce have taken up their new duties as monitors of rows eight and nine. Phillip Williams has left school. Henry Case practiced some of his Norwegian Stunts Saturday by coasting down Paine’s pinnacle on his skis? Frederick Pomeroy and Dorothy York each gave a birthday party on St. Patrick’s Day. Linn Card has been late twice in one week on account of the snow. The School Board should furnish him with a pair of skis. A surprise party entertained John Canedy in the school building on his birthday. Dr. and Mrs. M. B. Ballard entertained the faculty Thursday evening a week. Miss Rhea Barker of Elmira College attended the Botany class Friday. Frank Flick played a solo on his slide trombone in chapel Monday morning. It pleased the school so much that they insisted on his playing an encore. It is understood in the school that this is the first of a number of solos to be played by the members of the High School Orchestra. A different member is to have a solo each Monday morning. Miss Madeline VanSyckel visited school Tuesday. Miss Mae Nelson of Columbia X Roads returned to school Monday after being out six weeks on account of sickness. The Troy High School Athletic Association was formed Friday after school and the following officers were elected: President, Maurice McGee; Vice-President, Frederick Pomeroy; Secretary, Charles Joralemon; Manager of Baseball, Frank Flick; Manager of Track, Lee Smith; Manager of Basketball, James Robinson Pierce. Harold Gustin, a former high school student was juror last week. Mr. Cameron was a visitor in physics class Thursday afternoon. Miss Frances Gallatin visited the high school on Friday afternoon. Olive Ruggles of the Freshman Class, who has been absent from school for some time, has resumed her studies. Prof. L. R. Guillaume is enjoying a new Buick car. Mr. Brandt was out of town for the week-end. A second meeting of the T.H.S.A.A. was held Monday afternoon. Allyn Smith was elected manager of the tennis team. Edward Morse, a senior, has returned to school after being absent several days. On the occasion of Miss Flood’s birthday, Francis Ballard entertained her and a number of other girls at dinner on Friday evening. Several gentlemen were invited for the evening and all enjoyed dancing and other amusements. Everyone pronounced it a delightfully novel affair. Miss Helen Ballard has been elected manager of the Girls Tennis Club. Besides class games there will be match games with other high schools. Miss Winifred Pomeroy is treasurer of the organization. Miss Merle Benson was a visitor at school last Friday. Carrie Boughton of the Freshman class has returned to school after a week’s absence on account of sickness. Paul Crouch of Syracuse, accompanied Robert Grant on his rounds of the Junior High School, Monday. Girls – Gladys Ayers, Florence Burnham, Margaret Burnham, Julia Bu..ton, Jeanette Case, Margaret Cornell, Mildred Everts, Lucelia Field, Elizabeth Morse, Mary McGee, Janice Mitchell, Eva Morris, Violet Newell, Nell O’Connor, Jennie Pierce, Ella Saltmarsh, Eloise Sherman, Iva Tomlinson, Anna Williams, Kathryn Wolcott, Leah Clayson. Boys – Henry Case, John Canedy, Walter DeWitt, Lynn Dunbar, Robert Ellenberger, Harvey English, Edward Fanning, Charles Joralemon, James Judson, Maurice McGee, James Peckham, Robinson Pierce, Lee Smith, Allyn Smith, Arthur Tomlinson, Robert VanSyckel, Glenn Weigand, Theodore Watkins, Fred Watkins, Leonard Wilcox. Boys – Francis Collins, Willard English, Thomas McGee, Edward Smith, Ralph Sweeney. Girls – Madeline Bardwell, Ethel Bhovier, Leola Corey, Grace DeWitt, Elizabeth Joralemon, Margaret Joralemon, Hazel McKee, Olive Pierce, Gladys Thomas, Virginia Thomas, Eleanor Walters, Eva Stephens. Boys – DeLace Hoose, Llewellyn Hickok, Phillip Lyles, Harrison Morse, William Montgomery, Francis McGee, Austin Young. Girls – Helen Letts, Mary O’Connor, Lena Robinson, Margaret Ryan, Marjorie Stuart, Genevieve Wilcox. Boys – John DeWitt, William Hickok, Newell Clifford, Henry Sweet. Girls – Anna Alexander, Ruth Burgan, Arline Campbell, Ethel Carnochan, Kathryn Hooley, Wilda Smith, Louise White. Boys – Richard Ballard, Leon Baxter, Lawrence Gustin, Harry Hurlburt, William McGee, Floyd McIllwain. Enrolled, 25; percentage of attendance, boys, 80; girls 66. Boys – Russell Comfort, William McClelland, Oliver Mitchell. Girls – Clara Aldrich, Ruth Alexander, Eleanor Hickok, Edna McKeel, Barbara Morse, Kathryn Potter. Enrolled, 35, percentage of attendance, 85. Boys – Hugh Doloway, Clarence McIllwain, Henry Mitchell, William Moffatt, Joseph Morris, Edward Moss. Enrolled, 21; percentage of attendance, 86. Girls – Margaret Baxter, Marjorie Bohlayer, Violet Moffatt, Catherine Thomas. Boys – Franklin Potter, Kenneth Bond, John Comfort, John Kornarens. Enrolled, 55; percentage of attendance, 68. Ray Dann and Gladys Smith, former students visit school on Monday. Miss Laura Aspinwall of Buffalo, N.Y. and Miss Mary McGee of Williamsport visited the school on Tuesday. Frances Saltmarsh played two piano selections in chapel Monday morning. Tuesday was ‘clean-up day’ for high school. Most of the boys spent their vacant periods working on the lawn under the direction of Prof. Guillaume. That was an overwhelming defeat administered to us by Canton last Saturday. While we had the better of the pitching end of the game our boys were weak in the field and on team work. Towards the end of the game several players were shifted in order to try them out in different positions with the hope of developing a better team. John Canedy broke a wheel-barrow while working on the lawn Tuesday. Miss Vroman and Mildred Wolcott were visitors at the high school on Friday. Henry Case and Francis Ballard were among the fishers at Mountain Lake on Saturday. Fred W. Card was very kind to give the school a large number of shrubs which the agricultural class has set out around the building and on the lawn in front. Among the visitors of the week were Mrs. G. G. Beardsley and Miss Schadffer, the latter formerly teacher of English and music in this school, and The Rev. Hiram Bennett of Jersey City, N.J. Girls – Gladys Ayers, Celia Bullard, Florence Burnham, Margaret Burnham, Helen Ballard, Pauline Besley, Julia Burton, Jeanette Case, Leora Corey, Margaret Cornell, Mildred Everts, Emma field, Nellie Furman, Elizabeth Morse, Janice Mitchell, Eva Morris, Mae Nelson, Violet Newell, Nell O’Connor, Jenny Pierce, Ella Rockwell, Mildred Sweet, Dorothy Sherman, Frances Saltmarsh, Eloise Sherman, Lucinda Scott, Kathryn Wolcott, Dorothy York, Olive Ruggles. Boys – Theodore Baxter, Francis Ballard, Lee Cleveland, Clifton Doane, Lynn Dunbar, Robert Ellenberger, Harvey English, Charles Joralemon, Maurice McGee, Edward Morse, Harold Newell, Archie Rockwell, Charles Lay, Lee Smith, Allen Smith, Max Vineski, Glenn Weigand, Theodore Watkins, Fred Watkins, Leonard Wilcox. Girls – Madeline Bardwell, Mildred Baxter, Ethel Bovier, Grace DeWitt, Geraldine Howland, Elizabeth Joralemon, Margaret Joralemon, Arlan Kinch, Hazel McKee, Winifred Pomeroy, Olive Pierce, Dorothy Saxton, Addie Smith, Gladys Thomas, Virginia Thomas, Eleanor Walters, Eva Stephens. Boys – Francis Collins, Thomas McGee, Edward Smith, Leslie Smith, Ralph Sweeney. As School Closes. Seventh Grade. Boys – Richard Ballard, Leon Baxter, Richard Hoose, Harry Hurlburt, William McGee, Floyd McIllwain, Ned Stanton, Paul Wood. Girls – Clara Aldrich, Julia Bardwell, Hope Crouch, Frances Dewey, Glennie Gilkie, Eleanor Hickok, Kathryn Potter, Eleanor Pomeroy, Jean Rider. Miss Ruth Croman of Hughesville, Pa., spent the week end with her brother, Principal W. R. Croman. Examinations for high school entrance will be held Thursday and Friday of this week, beginning each day at 8:45 o’clock. Sunday evening, May 28th, Baccalaureate sermon in the Presbyterian church by the Rev. W. R. Holloway. 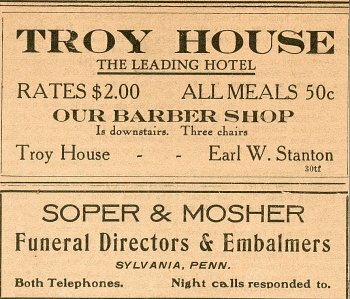 Tuesday evening – Alumni banquet at the Troy House. Friday, June 2d at 10 a.m. – Closing exercises at school building. Canton-Troy athletic meet at Alparon Park, Saturday afternoon of this week, beginning at 2 o’clock. The events will be 100 yard dash’ 220 yard dash, 440 yard dash, 880 yard run, mile run, pole vault, hammer throw, shot put, high jump, broad jump. Hear the songs and cheers of your favorite team. Admission, 25 cents. Miss M. Evelyn Jones, a graduated of Mansfield school of music and of the Ithaca conservatory, has been selected to succeed Miss Wheeler, resigned as teacher of music and drawing in the Troy public school. Though they lost the meet by 8 points, Coach Cosper and the Troy boys have reason for congratulation over the out come of the Troy-Canton field day at Alparon Park last Saturday. Six out of ten firsts is a record to be proud of even in defeat. A little longer training season doubtless would have turned the trick, but Canton won fairly so to the visiting team as a whole belongs the glory of victory. The stars for Troy were Lee Smith, firt in the pole vault, the broad jump and high jump, and Allen Smith who captured the 100 yard and 220 year dashes. For Canton, W. Randall was first in the mile run and the 880 yard run. Thanks to Mr. Pomeroy’s efforts with which both teams co-operated the bitterness of former years was largely done away with and both the visitors and the home team will recall the 1916 meet with pleasure. About 160 attended the party in Mitchell’s Hall in the evening, and enjoyed the program to the utmost. Time, 2 min, 10 4-5 sec. Height, 5 ft, 5 in. Time 4 min,. 59 1-5 sec. The officials were Dr. W. L. Rider, Referee; Prof. E. L. Brandt, Starter; Charles Ludington, Clerk of the Course; Harry H. Cosper, Edward Innes and Earl Bloom, Judges of Field Events; William Montgomery, Mr. Northrup and Prof. L. R. Guilllaume, Judges of Track Events; O. W. Jaquish, Announcer; Peter Herdic, Timer; W. F. Palmer, Scorer.